The Syrian government with support from its Russian, Iranian, and Lebanese allies has embarked on a major military operation to retake parts of Syria’s northern governorate of Idlib. As it does so, the US and its regional allies are rushing to position themselves to ensure the permanent partition of Syria is achieved. As Syrian forces push deeper into Idlib they have come up against a large amount of foreign-provided weaponry including US anti-tank missiles and even fleets of armored vehicles including Panthera F9 armored personnel carriers – joint-developed by the UAE and Ukraine and manufactured in Turkey. Despite the formidable arsenal provided to militants – the majority of which fight under the banner of Al Qaeda and its affiliates – Syria and its allies maintain air superiority. 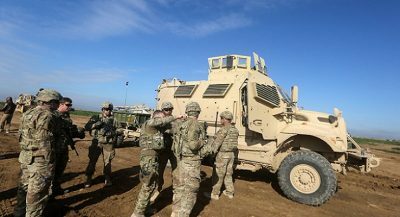 The US tried – and failed – to establish what US policymakers have called a “safe haven” or “buffer zone” in northern Syria where US military might could provide shelter for militants from Syrian and Russian airpower. While the US has successfully established such a zone in eastern Syria – the closest it came to doing so in northern Syria is NATO-member Turkey’s “Euphrates Shield” occupation zone and the smaller “Idlib Shield” zone which both border territory held by hostile Kurdish militants. Recently announced plans by the US to create a 30,000-strong “border defense force” comprised of US-armed and funded Kurdish militants may be intentionally designed to grant Turkey a pretext to begin widening its occupation zones to provide cover for the remnants of militants likely to be evicted from much of southern Idlib. Reports that Turkey is preparing an offensive to widen its occupation westward into Idlib are already circulating in the media. It should be noted that Afrin is located between territory Turkey is currently occupying. Turkish troops, should they seize Afrin, would effectively have expanded Turkey’s “Euphrates Shield” by 30 miles (53 km) and present an opportunity to for its troops to link up with troops of Turkey’s “Idlib Shield.” This would create a large, singular buffer zone within which US-NATO forces could harbor militants driven back by Syria’s most recent offensive. Depending on Turkey’s success, the zone could be expanded even further, even as far as including Idlib city itself – thus granting the US an opportunity to present it as a second Syrian “capital” much in the way Benghazi was used in Libya during US-led regime change there. There remains, however, the fact that Idlib is openly occupied and administered by Al Qaeda, making the proposal of transforming it into an “opposition capital” particularly dubious. A State Department official on Thursday suggested the U.S. military’s role in Syria post-Islamic State in Iraq and Syria (ISIS) will be focused on Iranian activities. David Satterfield, acting assistant secretary for Near Eastern affairs, was responding to a question from Senate Foreign Relations Committee member Chris Murphy (D-Conn.) about what function U.S. troops serve in Syria besides fighting ISIS, as Satterfield and other U.S. officials have indicated the military will be staying the country past the terrorist group’s defeat. Washington’s apparently shape-shifting Syrian policy should come as no surprise. The entire proxy war against Syria the US has waged since 2011 was always intended to eventually involve Iran. The abortive US-backed “protests” in Iran in late December 2017 marked what is likely only the first of many attempts to come in which Iran itself is directly targeted. The US occupation of Syrian territory will be difficult for Damascus and its allies to contest without being drawn into a direct military confrontation. Turkey’s occupation may be easier to confound, but if sufficient political will exists to maintain it along with US backing, it could effectively result in a Golan Heights-style occupation of Syrian territory that provides a long-term geopolitical pressure point versus Damascus for years to come. And while US efforts to destroy Syria have fallen short, the US now permanently occupies territory within one of Iran’s closest and most important regional allies. Like a splinter under the skin turning septic, the US occupation will remain a constant potential source of wider infection both for Syria and the rest of the region. The successes or failures of both Syria and its allies and Turkey in northern Syria over the following weeks and months will determine just how big a splinter is left as the conflict enters its final phases.